We recently have developed a new class of sequence-specific peptidomimetics-AApeptides, inspired by chiral PNA backbones. 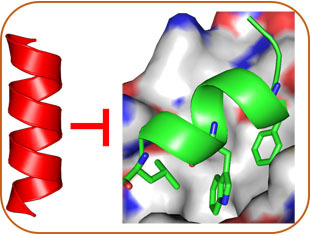 Our research findings reveal that AApeptides could fold into well-defined protein-like secondary and tertiary structures. Building upon preliminary results, we will continue to unveil the principle that guides the folding of AApeptides, so as to generate hierarchical secondary, tertiary and quaternary structure of AApeptides with predictable functions, i.e., artificial proteins with enzymatic activity. In addition to basic science, our lab has keen interest in chemical biology and medicinal chemistry. We strive to develop molecular probes or drug candidates through two complementary approaches: Rational Design and Combinatorial Screening. 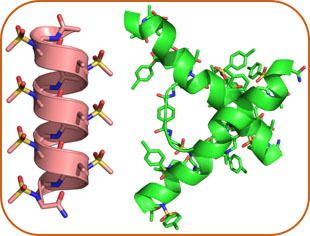 With the availability of helical structures of AApeptides and their remarkable stability and diversity, we are designing helical mimetics that recognize protein surface and disrupt cancer and HIV related protein-protein interactions. Meanwhile, based on the amphipathic structures of host-defense peptides, we are also developing AApeptide-based HDP mimetics that kill bacteria with broad-spectrum activity and less probability to develop antibiotic resistance. 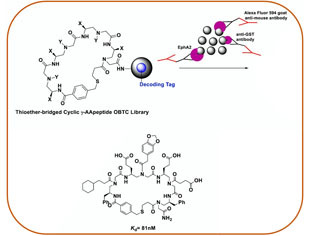 As a complementary approach to Structure-Based Design, Combinatorial Screening is also adopted in our lab for medicinal chemistry and chemical biology. With the remarkable stability and diversity of AApeptides, we are developing different AApeptide libraries, from which we hope to identify potent and selective molecules that can recognize proteins and other classes of biomacromolecules, and modulate their biological functions. Such hits could be developed into potential drug leads or candidates. As AApeptides can form well-defined secondary and tertiary structures, with manipulation of a variety of side chains, i.e. hydrophobic or hydrophilic groups, AApeptides could assemble into different functional materials. 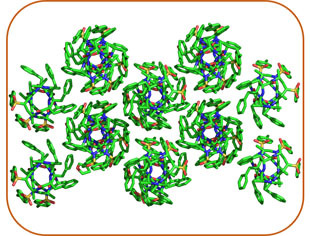 We are currently employing organic chemistry to build AApeptides with diverse supramolecular structures and explore their potential applications.